The Boy Scouts of America designate the Sunday that falls before February 8 (Scouting Anniversary Day) as "Scout Sunday" which is the primary date to recognize the contribution of young people and adults to Scouting. Scout Sunday tradition was started to make people in church aware of Scouting, and to allow Scouts to live out parts of what is pledged each week. The Scout Law says that a "Scout is Reverent" and the Scouts of all ages promise to do their "Duty to God". Parker Stoken, a Wolf Scout, has earned the Light of Christ medal. The purpose is to help the Cub Scout develop a personal relationship with Jesus. With his parents' active assistance and participation in this program, it is hoped that he will come to see Jesus as a real person and his friend. Garrett Stoken, a Webelos 2 Scout, has earned the Parvuli Dei (Children of God) medal.The purpose is to help young boys explore a wide range of activities in order to discover the presence of God in their daily lives as members of their families and parishes, and also to develop a good, positive self-image through the contributions they can make to the group or community. Garrett also previously earned the Light of Christ medal, and just crossed over into Boy Scout Troop 141 in Belvidere NJ. 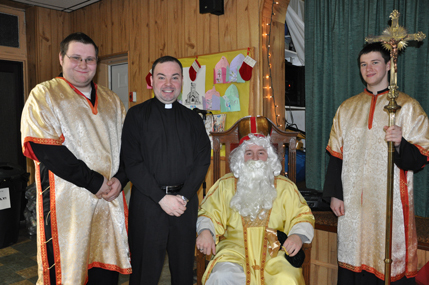 St. Nicholas visited Holy Ghost Church during our annual Christmas Party on December 16, 2012. St. Nicholas gave each child a gift for Christmas and as a way of saying "thank you" the children presented St. Nicholas with mittens, scarves and hats. These warm essentials will be donated to the needy children of the Ukraine to help them stay warm this winter. A few photos are included above of Holy Ghost Church's celebration of Good Friday with the Procession with the Holy Shroud, the Blessing of the Baskets, and Easter - Pascha - Resurrection of Our Lord. 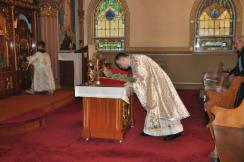 On Friday, March 30th, 2012, Rev. 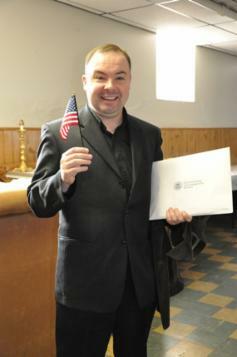 Petro Zvarych officially became a citizen of the United States of America! The Holy Ghost parish is so very happy and proud of this wonderful achievement and share in his pride and joy! Mnohaya Lita, Father Petro! Pictured (l to r): Rev. 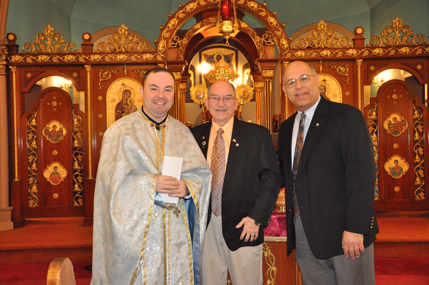 Petro Zvarych, Former Grand Knight William Eismont, and Ted Veresink. Holy Ghost Church would like to thank the Knights of Columbus, Union Council #345 for their generous donation to the Church! Please remember to support the fundraisers and functions of the Knights--for more information about KoC, Union Council #345, click on the "Links and Maps" tab on the left side of this page or click here! 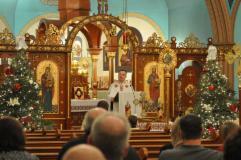 Holy Ghost Church would like to thank Father Andriy Oliynyik, C. Ss.R., from the Redemptionist Fathers of the Lviv Providence, Ukraine, for providing a wonderful Lenten Mission to our parish during March 2 - 4. 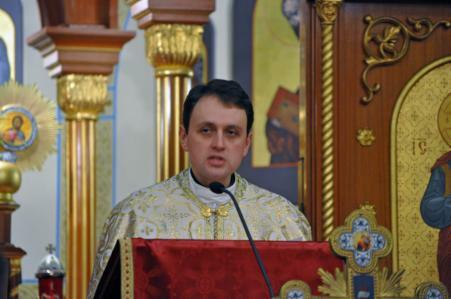 We truly appreciate Father Andriy for taking time away from his busy schedule to offer this mission to help deepen our faith in God and strengthen our relationship with Him. 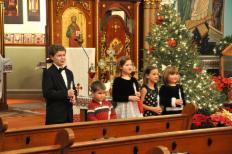 Following Compline, Holy Ghost sang Christmas songs with the young carolers providing wonderful vocals! 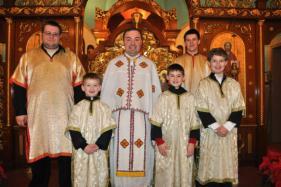 Father Petro celebrated Christmas Eve Liturgy 2011 and was supported by our altar boys (l to r) Nick Tomori, Parker Stoken, Father Petro, Garrett Stoken, Charles Tomori and Christopher Wynne. 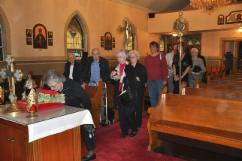 St. Nicholas spent Sunday afternoon visiting Holy Ghost Church during the annual Christmas party. St. Nicholas presented gifts and gave blessings to the children. It was a wonderful afternoon spending time together as a parish and sharing the joys of the Christmas season. 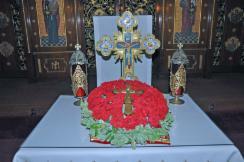 Father Petro and the Holy Ghost parish venerate the Holy Cross.